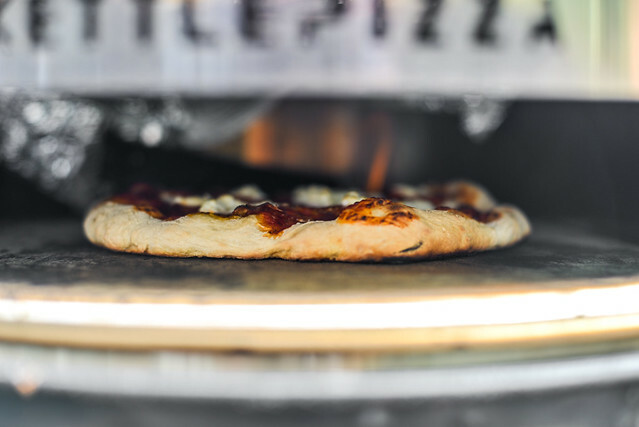 I really, really, really love my KettlePizza—it's the only piece of grilling equipment I've dedicated an entire post to. It goes against reason then that it's also my least used accessory as well. I'd like nothing more than be outside and quickly cooking one beautiful pizza after another in the blazing heat I can create in this grill-to-pizza oven conversion kit, but I have responsibilities to grilling recipes that always take precedence and force my pizza making ambitions to sit resting quietly in the corner. In an attempt to change that, I decided I should start sharing what comes out of my KettlePizza, since if I'm using it to produce content for the blog, it's certain to see more action. 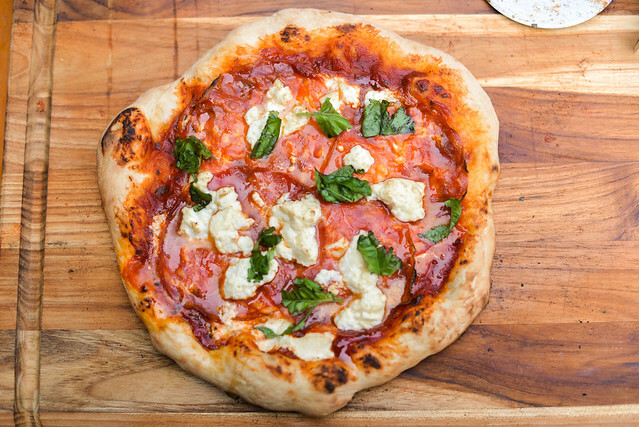 So from a grand pizza party I hosted over the summer, where there were numerous incredible pies, I wanted to introduce you to my favorite of them all—hot soppressata pizza with ricotta and fresh basil. Since this was my first foray into documenting my pizza making process, I totally forgot to capture creating dough, which was a Neapolitan-style recipe I grabbed from Kenji at Serious Eats. So I'll leave that to something to look forward to next time, but I did finally photograph and write down what goes into my pizza sauce—something I make all the time, but never shared. 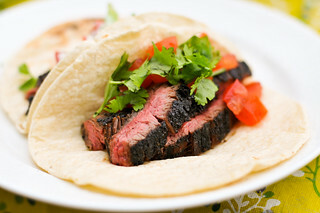 It start with room temperature extra-virgin olive oil, garlic, and crushed red pepper in a pan set over medium heat. 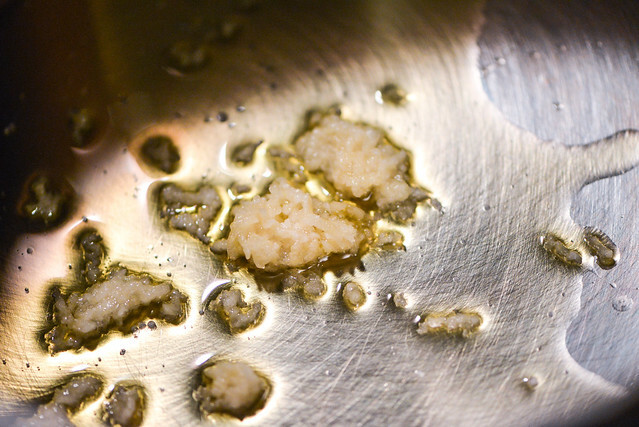 As the oil's temperature begins to rise, the garlic and pepper slowly flavor the oil. As the heat increases, bubbles form around the frying garlic, and its when these bubbles are forming in earnest, that I add in the rest of the ingredients to stop the cooking of the garlic to prevent it from burning and tasting bitter. This a very thick and rich sauce. It's made up of a whole can of tomato paste and three 15oz cans of tomato sauce. 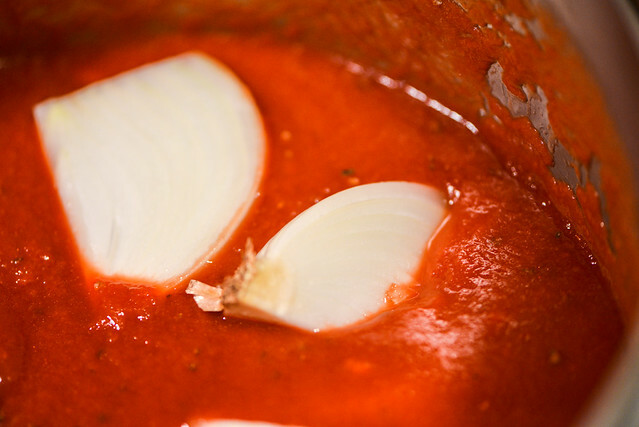 The tomato paste makes the sauce plenty thick from the get go, but I still let it to simmer for 20-30 minutes with a quartered onion and oregano to allow the sauce to thicken even further and develop a more concentrated flavor. Once it's at this constancy—where a spoon run through the sauce leaves a visible trail—I remove it from the heat, discard the onion, and add in fresh basil and season with salt and pepper. The sauce is usually fairly acidic at this point, so I balance it out with a sugar, adding a teaspoon at a time to ensure the sauce doesn't become overly sweet—it usually only take one or two teaspoons total. This sauce should top way more than the four pies the recipe covers. Luckily it freezes very well, so I often have a batch of this sauce laying in wait, ready to be defrosted whenever the pizza making mood hits. With the sauce done and after the dough had been fermenting for three day in the fridge, it was time to get the pizza party started. I fired my KettlePizza up starting with a full chimney of lit coals spread along the back of the charcoal grate in a crescent moon shape. I added at least another half chimney of unlit charcoal to that to increase the heat and keep the fire burning longer. Next I set the KettlePizza insert and baking stone in place. 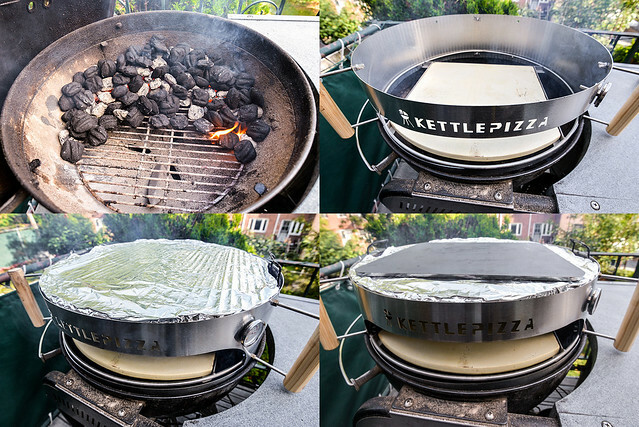 After that, I put a foil lined grilling grate on the top of KettlePizza, followed by the Baking Steel. Finally, I set the lid on top and waited 45 minutes for the grill to preheat. This brought the oven into the 750-800°F range. Before cooking my first pie though, I placed a wood log into the basket that rests at the end of the pizza stone. Once that baby was lit and producing visible flames, the temperature shot up to around 900-950°F and it was prime time for pizza making. I've been practicing my dough stretching skills and making strides. What I'm going for is a 12-inch circle that has a constantly thin center with and even amount of thicker dough around the edges for the crust. Trying to get the right stretch is the hardest part of the process for me, but as you can see, I did a decent enough job here. With no time to sit and take in my achievement, I quickly moved on to topping by first spreading sauce along the thin area of the pie. Next I ripped off some pieces of fresh mozzarella procured at the incredible Casa della Mozzarella up at Arthur Avenue in the Bronx. On top of cheese I laid out thin slices of hot soppressata so it covered the entire pie, overlapping each piece as necessary. Lastly I dolloped on a few spoonfuls of another Casa della specialty—fresh ricotta. Then using my crutch, the Super Peel, I transfer the pie into the KettlePizza with ease. It took only about three minutes for the pizza to fully cook. Since it goes so fast, I never leave it alone. Once the bottom sets, about 30-60 seconds, I use the pizza peel to rotate the pie to make sure it cooks evenly all over. Since the fire is so hot, it can quickly burn, so this takes a watchful eye and persistence. This pie was actually the third for fourth pizza we made that day, and so the temperature had already dropped from 950°F to 825°F, which resulted in my pie not getting the beautiful leopard spotting I was able to get with of the earlier ones. Still, the crust cooked pretty perfectly and the pizza was a sight for sore eyes. It only got prettier as I topped it was torn fresh basil. The first cut into the pizza revealed a puffy crust with a crisp edge and pillow interior that had an awesome hole structure. It tasted as good as it looked too, with a tangy and salty flavor that had a nice chew to it. The toppings can't be understated here either. This isn't any type of revolutionary set of toppings, but they're a group that works really well. The bright and acidic sauce was balanced with the creamy and mild mozzarella. The hot sopressata brought the heat along with its cured sausage funk that made it more unique choice than pepperoni (although nothing can beat pepperoni as my favorite pizza topping). 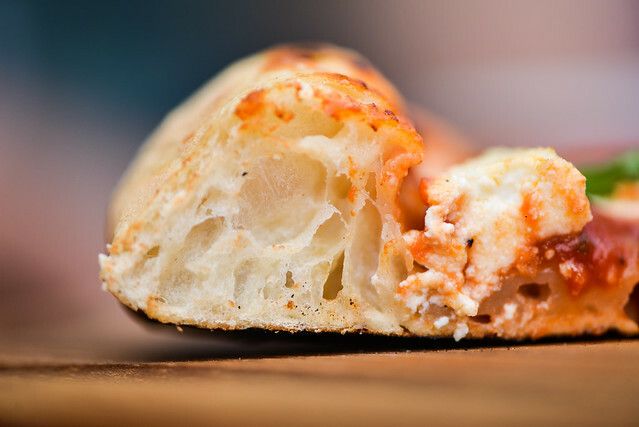 The spice of the sopressata got a nice contrast with each pocket of creamy ricotta. All of this came on a crisp crust whose light charring added to the flavor in a meaningful way, making the pizza on the whole fully realized and leaving me a very happy eater. 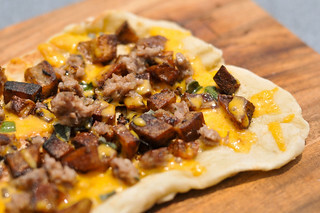 Seriously, if you don't have a KettlePizza yet, I don't know what you're waiting for. Using my beloved KettlePizza to make a pie with an excellent crisp and chewy crust topped with a killer combo hot soppressata, mozzarella, ricotta, and fresh basil. To make the dough: Combine flour, salt, and yeast in a large bowl and whisk until homogenous. Add water and incorporate into flour using hands until no dry flour remains on bottom of bowl. Cover bowl tightly with plastic wrap and allow to rise at room temperature for 8 to 12 hours. 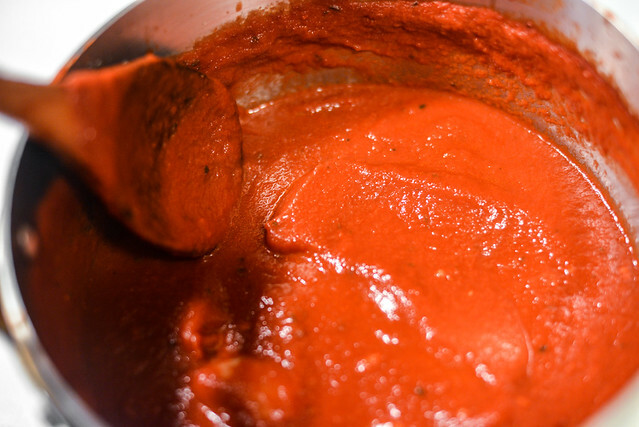 To make the sauce: Place olive oil, garlic, and crushed red pepper in a medium saucepan. Turn heat to medium. When bubbles begin forming around garlic, add in tomato sauce, tomato paste, onion, and oregano; stir to combine.Bring to simmer, then reduce heat to low and cook, stirring occasionally, until sauce thickens slightly, about 20 minutes. Stir basil and sugar. Season with additional sugar, salt, and pepper to taste. Set aside or transfer to an airtight container and place in refrigerator until ready to use. 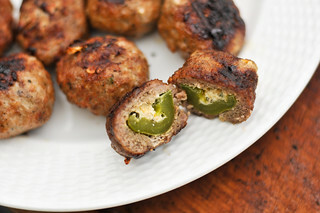 To make the pizza: 2 hours prior to cooking, remove dough from refrigerator, shape into balls, and allow to rest at room temperature, covered, for at least 2 hours before baking. Heat KettlePizza or pizza oven to 950°F. Alternatively, set a baking stone or Baking Steel on upper middle rack in oven and heat on highest setting possible for 45 minutes. 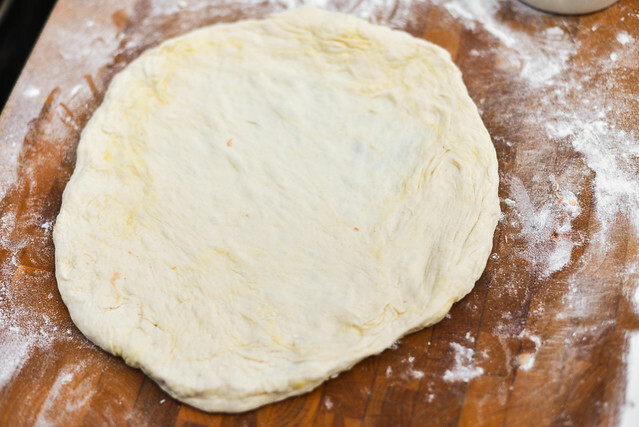 Stretch dough into a 12" round. Spread on a layer of pizza sauce followed by torn chunks of mozzarella. Cover entire pie with slices hot soppressata, overlapping slightly if necessary. Spoon on dollops of ricotta. 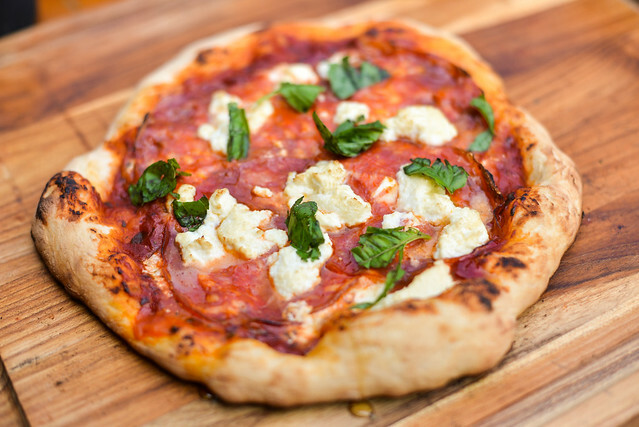 Place pizza in pizza oven and cook for 2-3 minutes, rotating pizza for even cooking as necessary. 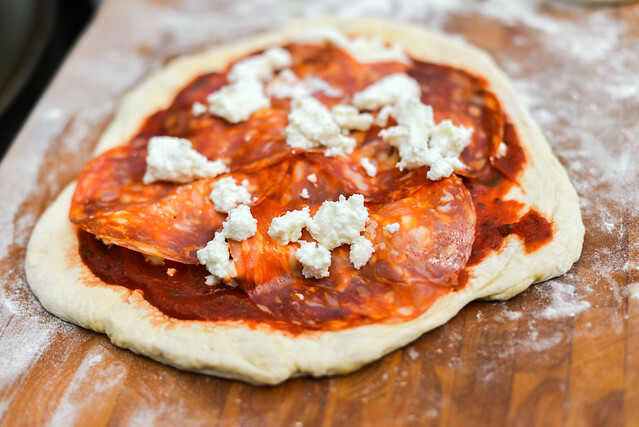 Alternatively, place pizza on baking stone or steel in heated oven and cook until crust is baked through and mozzarella is melted, 7-10 minutes. Remove from oven, top with torn basil to taste, slice, and serve immediately. Thanks for these recipes, were helpful to me.